Hey there, book dragons! I hope you all had a lovely week. (Side note, I can’t stop using the word ‘lovely,’ thank you Jennifer Niven for bringing that back in style!!) I am very pleased to be here today with the wonderful Siobhan Vivian, author of many books, her most recent being The Last Boy and Girl in the World. Siobhan Vivian was born in New York City on January 12, 1979 . . . which might sound like a long time ago, but really isn’t. She grew up in Rutherford, NJ, where she got into trouble for such things as constantly talking out of turn, bringing a stray dog into school in a stolen shopping cart, passing notes to her friends, telling jokes, sneaking out, and not doing her homework. Siobhan attended The University of the Arts, where she graduated with a degree in Writing for Film and Television. She received her MFA in Creative Writing: Children’s Literature from The New School University. Siobhan has worked as an editor of several New York Times best-selling novels at Alloy Entertainment, a scriptwriter for The Disney Channel, and she currently teaches Writing Youth Literature at the University of Pittsburgh. Siobhan can be reached on Twitter, Instagram, Goodreads, Facebook, and her own website. I had the pleasure of meeting Siobhan at BookCon last Saturday and she was so sweet! She was the first author that I had the courage of introducing myself to, and I’m glad that I did. Siobhan and I even selfied together. (I brought a camera, so she has the photo.) We had matching pins for her book, too! I was pleasantly surprised that she remembered my pre-order because I’m sure there were many for her wonderful book. Unfortunately I haven’t had the chance to read TLBAGITW yet, but I have read The List and that was great! Without further ado, here is my interview! Sophie: Hi, Siobhan! Thanks for chatting today! Tell us something that we can’t find in your bio. Siobhan Vivian: When I was a kid, I used to want to be a Talk Show Host. 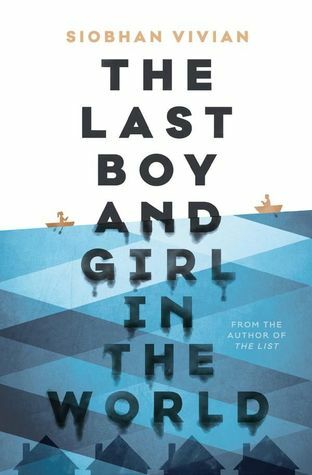 S: The Last Boy and Girl in the World is different from all your other novels, can you tell us what inspired it? SV: I heard about a town where something similar happened (a flood, and then a complete dismantling of the neighborhood) and thought it would be an interesting place to set a story. S: Is there a character you relate to most? SV: Keeley is probably the closest I’ve ever come to writing about myself. S: What was your favorite scene to write? The hardest? SV: Favorite was definitely Secret Prom. Hardest was the showdown between Keeley’s Dad and the Governor. S: How was writing this book different from any of the others that you wrote? S: Did your writing process look different for this book than others or do you have a tried and true routine? SV: The only thing tried and true about my routine is that I’m usually miserable during the first draft. I am a terrible first draft writer. S: When you’re reading your piece in your head do you give your characters different voices? S: Do names have any significance in your work? How do you choose names? SV: I try to find names that sound “real”. So I often go to the newspaper, or Facebook and troll people’s friend lists. S: I love that you troll Facebook! Would you rather read only the first page of a book or the last? SV: First. Because then I can make up the rest in my own head! S: I feel the same, I’d rather not be spoiled. The last page is too out of context! Alright we’ll wrap it up soon here. Are there any upcoming appearances that readers can come meet you at? SV: I was just invited to Texas Book Festival in November. I love Austin. Can’t wait to be back there! Big, big thank you to Siobhan for being so friendly and taking the time to answer my questions! I really appreciate it, and look forward to what you’re coming out with next! After I finish up When We Collided I am definitely planning on reading this book next. I am so behind on my reading challenge this month, but thankfully I have a few books buffering me from falling behind. I hope you enjoyed this interview as much as I did! Thanks for hanging out with me today!